Meredith was worried that Derek was cheating on her on Grey's Anatomy Season 11 Episode 16. The installment gave Stacy Glanzman, Amanda Steinmetz, Mary Kate Venedam, and Christina Tran plenty to discuss regarding MerDer, Japril and much more. 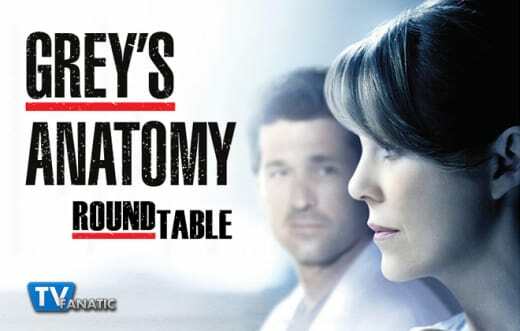 What was your favorite quote or scene from Grey’s Anatomy Season 11 Episode 16? Stacy: I gotta go with Callie’s shout out to “Team MerDer.” That was funny that they had her use their shipper name. Amanda: I agree with Stacy. “Team MerDer” was a nice meta moment for the show and for fans. Mary Kate: I agree with everyone else, I loved the scene with Meredith, Alex, Callie, and Maggie in their secret spot, just like the original interns did in Grey's Anatomy Season 1. I’m all for this new crew hanging out and it’s so fun to see their relationship. Christina: Hooray, 4 for 4! I loved the throwback hangout scenes. What was your least favorite scene? Stacy: I don’t really have a specific scene, but I was disappointed they spent the whole hour questioning whether Derek cheated and didn’t resolve it. Did they really need to leave us on a “did he cheat?” cliffhanger two weeks in a row? Amanda: Nothing in particular. Maybe the scene where the husband decided he wasn’t going to get the brain surgery. That made me really mad. Mary Kate: There wasn’t anything I truly disliked, but like Stacy, probably the ‘did he cheat?’ question. After dragging it out, it seems more likely that they are building it up for Derek not to have cheated. Not that that is a bad thing, it’s just a prolonged reveal. Christina: I, too, didn’t care for being left with the same cliffhanger two weeks in a row. I know there are still numerous episodes left, but come on! Derek rushed back to Meredith at the end. Predict what he has to explain. Stacy: Well, it’s obviously not something he felt he could explain over the phone, so I’m assuming he’s guilty of something. I’m not saying he definitely cheated, but I don’t think he’s completely innocent either. Amanda: He obviously did something or was about to do something. Otherwise, he wouldn’t have needed to run back to Seattle. My guess is that he was about to cheat with a woman that he grew close to, and then Meredith called making him realize what he was about to do and lose. Mary Kate: Either he cheated or got really close to it and wants to explain the real story to Meredith’s face so she understands. Christina: He’s back for good because he realized that he shouldn’t have ever left. As for the woman on the phone, she was someone he almost got too close to at work. How’s April doing? Are you concerned for her wellbeing? Stacy: I think she’s doing okay considering. Everyone grieves differently and no one likes to be told that their way of coping isn’t the right way. Obviously, it’s bad if you’re not coping at all, but I don’t think that’s the case with April. I think she’s dealing with it, but doesn’t want other people treating her like she’s going to break at any moment, especially her husband. I don’t blame her for that. Amanda: I think SHE thinks that she’s doing okay. There will be a moment coming up where she breaks down or something. Mary Kate: I think she’s coping the best way she can. 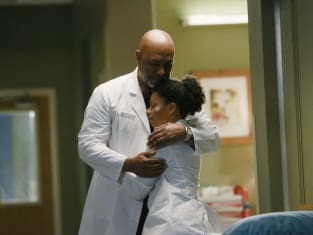 I don’t think she’s fully processed everything, but when she does she may breakdown and Jackson will be there for her. Christina: She’s doing the best she can. No one can tell us how best to deal with life. It’s going to take more time, but she’s got Jackson to help her pull through. What did you like most about Calzona’s interactions? Stacy: I love seeing that they still truly care about each other. Callie was concerned that witnessing the kiss hurt Arizona, and even though she didn’t do anything wrong and had nothing to be sorry for, she still didn’t want to hurt her. Arizona knew it would be awkward and make her look jealous to tell Callie about “steak knives,” but also didn’t want to see her get hurt. I think there’s hope for these two. Amanda: It’s nice to see that they can still be there to support each other, but that only makes me want to see them work things out more. Mary Kate: I liked the fact that they were getting along and not arguing. It’s unusual for this season I’m wondering if this will bring them closer together or just make it obvious that they need to stay friends. Christina: I mostly liked that Calzona was there for one another. I don’t particularly want to see them back together and like this different type of chemistry they have as almost friends now. Jackson: What is the matter? April: What's the matter is that you keep holding me like this delicate flower that's gonna break every time you look at me. That is what is the matter. Meredith: She was perky, and she sounded happy and tall with a lot of great hair. Alex: You saw her? How did you see her? Meredith: I didn't. I heard her voice. Her perky, happy, tall voice. Maggie: I hate voices like that. Alex: You can tell by the voice? Permalink: You can tell by the voice?